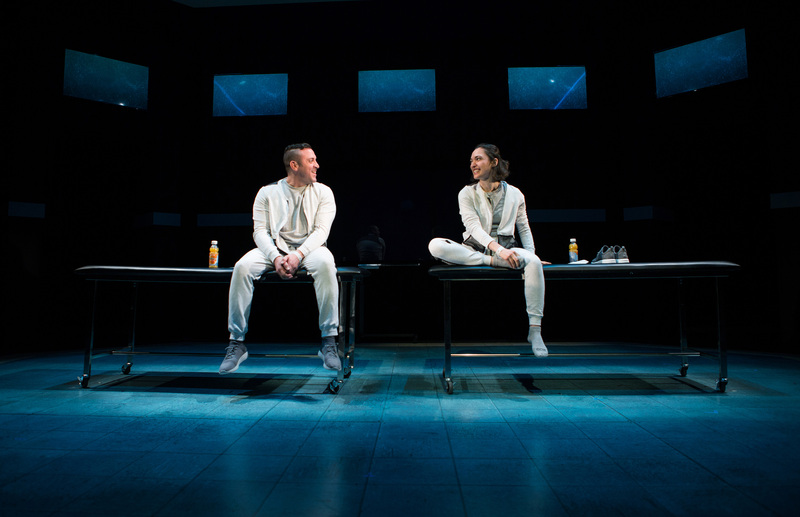 Joe Estlack as Tristan and Ayelet Firstenberg as Connie meet and, perhaps, fall in love, in SF Playhouse’s production of “The Effect” by Lucy Prebble. Connie (Aylet Firstenberg) and Tristan (Joe Estlack) meet cute. They are experimental subjects housed in a clinic for four weeks as test subjects for a new antidepressant. As they are thrown together under these intimate circumstances (they cannot leave and everyone else is staff), Tristan, not surprisingly, makes a romantic move. As is typical of lovers in stories, they are, of course, mismatched: Tristan is an optimistic, happy-go-lucky, take-it-as-it-comes sort of guy while Connie is a pessimist who struggles with depressed thinking. So far so good. But when they fall in love, how do they know if it’s real? After all, they are under the influence of a drug. It’s a disturbing question, and one with which many can identify. After all, it is not uncommon to experience a tipsy tip into romantic entanglement. It’s a simple premise, but thanks to a well-constructed script, smart acting, emotional authenticity, and excellent production values, it delivers a satisfying punch. Nina Ball’s excellent set seems very real and very creepy. As the manipulative Dr. Toby Sealy in charge of the experiment, Robert Parsons is simultaneously charming and repellant. Dr. Sealy has hired his ex-lover, Dr. James (Susi Damilano) to assist, but kept her ignorant of some important details. Damilano’s spot-on characterization might add yet another well-deserved “outstanding performance” award to her list of credits. All of this adds up to a story that keeps us guessing with unexpected twists and revelations and sends us home with plenty to think about. “The Effect” continues at SF Playhouse through April 28, 2018. For further information, click here. “The Effect” by Lucy Prebble, produced by San Francisco Playhouse. Director: Bill English. Scene Designer: Nina Ball. Costume Designer: Brooke Jennings. Sound Designer: Theodore J. H. Hulsker. Lighting Designer: Kurt Handisman. Properties Designer: Jacquelyn Scott. Projections Designer: Theodore J. H. Hulsker. Dr. Lorna James: Susi Damilano. Connie Hall: Ayelet Firstenberg. Tristan Frey: Joe Estlack. Dr. Toby Sealey: Robert Parsons. Posted in Reviews.Tagged Ayelet Firstenberg, Bill English, Charles Kruger, Joe Estlack, Lucy Prebble, Nina Ball, Robert Parsons, san francisco bay area theatre reviews, San Francisco Playhouse, Susi Damilano, The Effect, theatrestorm.